The markets rallied more than expected this week, the SPX is up more than 3% and closed at 1109. Last weekend I posted the following chart and explained that I missed some strong updays to get bullish. There I got my updays! The current fractal is now very similar to the one we got in July 09. If this correlation continues we should see new highs soon. 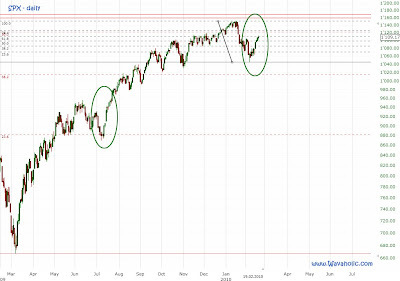 After the rally on Tuesday I had to change my SPX count: Minor 1 bottoms at 1045 on February 5th and corresponds now to most of the other indices (DAX, ASX, ES, Nasdaq, ...). 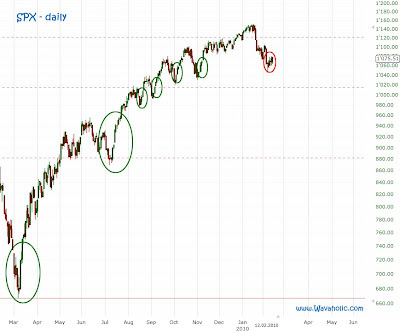 Minor 2 has already reached the 62 % retracement level and this possible a-b-c move from 1045 begins to look like a 1-2-3-4-5 in progress, currently in 3, since wave c is already twice the size of a and it's more common for a third wave to extend that much than for a c wave. Thus, I added a bullish count: an A-B-C down completed from 1150 to 1045 and now the next impulse up to 1200-1300. This will be confirmed above 1150. It's not uncommon for a second wave to retrace more than 62 % though. Minor wave 2 of Intermediate (1) of Primary [A] retraced almost 70 %. No change here. 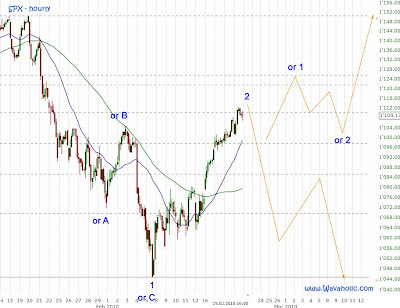 The bullish count is also possible for the Nasdaq though. No change here as well. Still in Minor 3 up. To sum up, although the bearish counts are still valid the bears are about to lose again. The market needs to turn within the next few days and plunge. If not the bullish count is likely underway.